When our clients want to go for Crappie we love it. There’s still no thrill quite like seeing our clients coming off the boat at the end of a trip with a big stringer full of slabs wearing an ear to ear smile to match it’s size. 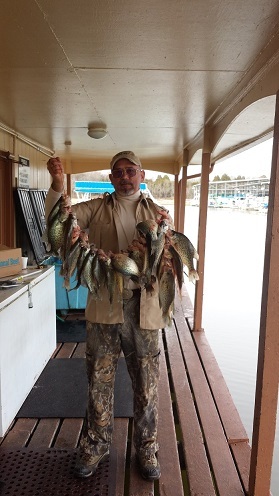 When a customer goes out for a day with the Nashville crappie fishing guides team we bring a combined 14 years of experience that we apply to make the trip as good of a fish catching day as we can. Over the years we’ve learned where the really good spots are and have (way-points) that are programmed into our GPS devices . 90% of the fish are only in 10% of the water at any given time, and more often than not we know where that elusive 10% of the water is. Primarily we Crappie fish on Nashville’s Percy Priest Lake which is famous for producing fantastic numbers of large Crappie year in and year out. And after years of being on Percy Priest chasing them it’s never gotten old to us. We know the fish’s habits and yearly patterns/movements. We know where the fish are! But that doesn’t mean we can ALWAYS make them bite; but we can always find them and ply them with baits that usually work. When you book a trip with the Nashville Fishing Guides team you can know that we will give 110% effort to get you on active fish. And with our modern, spacious boats, latest electronics, quality fishing tackle and tons of knowledge, you’ll have a fun trip on the water. Pick up the phone, give us a call, or follow this link to book your trip today! with the Crappie Fishing Guides.